The short answer is no. I’m not really sure why Adobe felt this was a necessary update that they felt was worthy of charging money for. The long answer…well, I’m good at the long answer. Hold tight. First off, this release is numbered a bit differently than previous releases. It’s a point update (CS5.5), so it’s not quite a full update warranting an entirely new version number (CS6). Previous Creative Suites have used whole numbers, with the applications themselves updating their revision numbers as patches have been released (Photoshop 10.01, for example). This fact in itself makes me wonder: is this simply a bugfix release with a ton of marketing and an actual purchase price behind it? The list of updated applications would seem to indicate this is the case. There are numerous improvements across the board to a few of the applications, but others receive no update that I can see. Photoshop, Photoshop Extended, Illustrator, and Fireworks are still CS5. For most users, this means that there is no reason to upgrade. Adobe should continue to support these versions with patches (as long as they don’t start charging for those too) until the next full release comes out. I’m pretty disappointed in this, because there are still numerous issues with Photoshop alone that haven’t been addressed (this problem is ongoing). Adding GPU acceleration is great, except that most artists I know end up turning it off. And we’re still stuck with layers not able to be dragged between tabbed windows. Acrobat X Pro adds improved integration with Microsoft products, including Office 2010 (meaning the icons look like they belong in Office 2010 now) and Sharepoint. It also adds online file sharing, which I’m sure won’t be exploited any time soon, and a new fullscreen viewing mode. There’s also a wizard for creating PDFs, and an improved toolbar. Admittedly, I don’t use InDesign much (or at all), so I won’t go into too much detail. It doesn’t look like much to me, but feel free to check for yourself (warning: Adobe randomly changes their site around from time-to-time, so, sorry if the link is broken). I pay for this thing every time I upgrade, but after the first time, I’ll likely never use it again unless I need to mix multichannel audio. Oh yeah, 5.5 adds native multichannel 5.1 support. There is also project exchange with other NLEs. I still think this application falls far short of Cool Edit and Sound Forge, but at least it will visually match your other Creative Suite applications. Dark grey for the win! Now, it’s been quite some time since I used Dreamweaver (back when it was a Macromedia product, actually), but it’s an application I know pretty well that works in a field I know very well. In version 5.5, Dreamweaver adds CSS3/HTML5 support, which is interesting since neither of those specs are finalized yet. I’m guessing further patches will make corrections to these specs as they evolve. There is also a multiscreen preview so that you can view your output on multiple devices at once. Dreamweaver looks like it’s as suited for modern web design as it’s always been. It’s not the way I prefer to do my web work, but if you like Dreamweaver you’ll probably be happy with the upgrade overall. It really looks like After Effects got the lion’s share of changes this time around. Stereoscopic 3D is far improved for this version, and it looks like anaglyph rendering is no sweat, either. The cameras actually have a true bokeh blurring filter now, so no more multi-layer nightmares for depth-of-field. This pleases me. The Warp Stabilizer tool is worth its own paragraph, for sure. This thing takes most of the work out of stabilizing footage. It will analyze your scene and automatically smooth out the motion, and can crop and scale the edges to fit your composition to the smallest necessary (or largest possible. if you’ve done footage stabilization, you know what I’m talking about). It looks like Adobe has put the seam carving (aka content-aware scaling) algorithm to good use here, as After Effects can fill in the now-missing border data from adjacent frames. Pretty impressive stuff (seriously, go check out the videos). Given the improvements to cameras and lighting, as well as 3D stereoscopy and camera tracking, I’d say After Effects 5.5 is a definite improvement. Flash Professional 5.5 shows mostly incremental improvements over CS5. Most changes appear geared toward mobile content development. I have opinions on this, but those are outside the scope of this already lengthy post. The Flash team has always been very involved with the user community, and there are improvements on this front as well. There are TLF (Text Layout Framework) control improvements, streamlined publish window (THANK you, that thing was really starting to show its age), as well as…(drum roll)…autosave. Whooo. Flash development cycles generally seem to alternate between tools for developers and tools for designers. In CS5 (v10.1), we first received the TLF. In CS4 (v10), we were blessed with rudimentary 3D support (aka flying cards in space). Of course, I see absolutely no mention of Molehill on the CS5.5 page, so I guess that’s a wash for this version. Stick to FlashDevelop or FDT. So, other than these very limited (and totally plausible!) situations, I’d say CS5.5 is a cash-grab for Adobe, since most of this crap could have been released in a patch (and should have). Alright, with the exception of After Effects, Audition, and Dreamweaver. If you use any of these three regularly, they might be worth the individual upgrade, but certainly not worth upgrading the entire suite. So, sorry Adobe, all this is doing is making you look greedy. 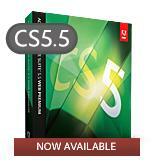 I agree with your conclusion, But I bought it since I never had cs5.5 before only cs 3 so it’s pretty much a huge leep. and yea adobe charges waaaaaaaaaaaay too much for there stuff.